The hospital provides specialist neurology and ophthalmology services with specialists in these fields visiting weekly. Please ensure you book ahead to book appointments for these services. Specialist Neurologist Georgina Child consults at the UVTH Sydney clinic on Wednesdays. Neurologic conditions include those which affect the brain, the spinal cord orcause weakness associated with peripheral nerve or muscle disease and those conditions that cause seizures. Careful examination is important to determine where in the body a problem might be, to discuss the possible causes and to formulate a diagnostic and/ or a treatment plan. Georgina works collaboratively with UVTHS medicine specialists, imaging specialists, oncology specialists and surgery specialists. Formulating more effective strategies in the management of poorly controlled epilepsy. Deafness occurs in dogs probably with the same frequency as in people and the most common causes are congenital (recognised generally in the first 6 months of life) and age related (senile or degenerative deafness). Congenital deafness is most likely due to a genetic abnormality and is seen more commonly in some breeds including Dalmatians, Australian cattledogs and English Bullterriers. It can, however, be seen occasionally in any dog breed and deafness is usually apparent by 6 weeks of age. Deafness may affect one or both ears. Deafness due to genetic abnormality unfortunately is permanent. Brainstem Auditory Evoked Response (BAER) testing is the most sensitive test in assessing hearing. Other less sensitive tests are available eg BAERCOM but are these tests are significantly less accurate. Breeders of Dalmatians, ACDs, English Setters and Bullterriers are encouraged to routinely have puppies hearing evaluated by BAER testing prior to pups going to pet homes and before making breeding decisions in an effort to reduce the incidence of deafness in their breeds. Researchers at USyd are working with Dalmatian breeders to try and establish the genetic basis for hearing loss in this breed. BAER testing can be used to evaluate the hearing of any dog (or cat), young or old that is suspected of being deaf in one or both ears. It is a test that determines whether cochlear function (inner ear) and the “wiring” to hear is intact. The volume of the sound in the test can be varied but this test does not assess degree of any partial hearing loss. However “selective” deafness can be distinguished from true deafness! BAER testing requires ear plugs to be worn and 3 fine electrodes to be inserted under the skin. A mild sedative is usually given prior to testing so the foam earplugs don’t irritate puppies ears. Eye Clinic for Animals (ECA) s the oldest and largest veterinary ophthalmology practice in Australia. We providhe highest professional level of care for small, large and exotic animals in Sydney and regional areas of NSW. Established in 1982 ECA now has 3 highly trained and experienced partners, Dr Jeffrey S Smith (BVSc, FACVSc, DACVO), Dr Cameron J G Whittaker (BVSc, DVCS, MACVSc,ACVO), and Dr elly A Caruso (BSc, VMD, MACVSc, DACVO). Eye Clinic for Animals is the only veterinary ophthalmology practice in Australia to have all partners being Diplomates of the American College of Veterinary Ophthalmologists – the worldwide “gold standard” in specialist qualifications in the field. 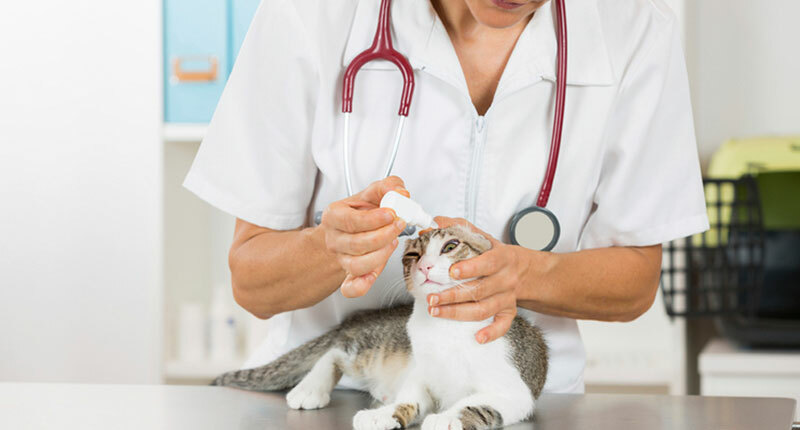 A veterinary ophthalmologist is a veterinarian who has undergone an intensive training programme over many years and passed an exhaustive set of written, practical and oral exams in order to be granted specialist status. An eye examination usually involves the use of sophisticated equipment and generally takes between 10 to 30 minutes. Other diagnostic tests may need to be performed as well. Usually examinations are performed without sedation or too much restraint. At ECA we have a special interest in eyelid surgery and reconstruction, lens diseases especially cataract surgery, laser surgery for glaucoma, retinal disease and surgery, and ocular manifestations of systemic disease. ECA also has a strong interest in student and post graduate education. As such the ECA partners lecture both at Sydney University and throughout Australia and the World, including Japan, South Korea, New Zealand and North America amongst others. Finally ECA strongly believes in encouraging research in vision in animals and humans. ECA is currently involved in development of the “Bionic Eye” in collaboration with the University of NSW amongst other projects. For more information visit http://www.eyeclinicforanimals.com.au .